Matthew Scully is an unusual proponent of animal rights, coming from the Christian-favoured, U.S. Republican party. Indeed, he speaks about people automatically assuming he is on the side of hunters and pig 'farmers' when, in fact, he has been a vegetarian for over 30 years. While Scully does support animal rights, he makes that stand from a generally religious perspective, arguing that current treatment of animals is an abuse of god-given dominion, and disagreeing with the secular reasoning of animal rights proponents like Peter Singer. 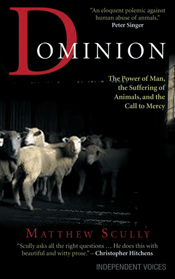 Scully's ability is shown when coming to the main thrust of his book, where he writes about animals, how they are treated and how they should be treated. He is an excellent writer (a former speechwriter for then-president George W. Bush), and a dutiful investigator, travelling to most of the places about which he writes.